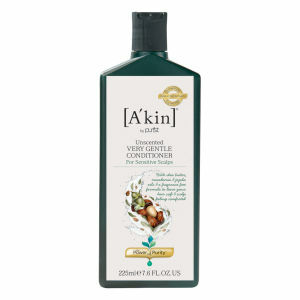 Deeply soothing and fragrance free A’kin Unscented Very Gentle Conditioner is perfect for sensitive and fragile scalps. It’s moisture locking formula leaves your hair silky soft, manageable and your scalp comforted. A’kin Unscented Very Gentle Conditioner boasts certified organic shea butter, nourishing Australian certified organic avocado, macadamia and jojoba oil combined with anti-oxidants, vitamins B5 and oat protein so that with regular use, those with sensitivities and irritations are likely to experience symptomatic relief. Gentle enough for children. Aqua (Water), Cetearyl Alcohol, Glycerin, Sorbitol, Behentrimonium Methosulfate, Macadamia Ternifolia Seed Oil, Butyrospermum Parkii (Shea) Butter, Hydrolyzed Oats, Lecithin, Simmondsia Chinensis (Jojoba) Seed Oil, Glyceryl Laurate, Panthenol, Potassium Sorbate, Citric Acid, Sodium Gluconate, Persea Gratissima (Avocado) Oil, Rosmarinus Officinalis (Rosemary) Leaf Extract.